Walmart offers the Canon PIXMA TS3122 Printer for $19. 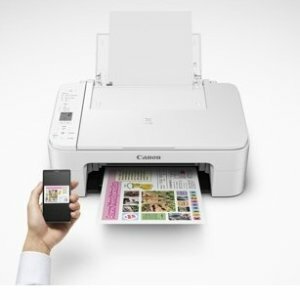 Features: The Canon Pixma All-in-One Printer (white or black) Wireless Inkjet Printer is a compact solution for all your home printing needs. With AirPrint and Google Cloud Print, it makes it easy to print wirelessly from your favorite devices. You can also print documents from any computer in your home or office thanks to its WiFi capability. The Canon Pixma ts3122 printer is compatible with optional XL ink cartridges (sold separately), which can help you print more when you need to and extend the time between replacing ink cartridges. Its fine hybrid ink system delivers rich and detailed photos and documents. The Canon Pixma All-in-One Printer (white or black) Wireless Inkjet Printer is ideal for school projects and papers, home office and business needs and more.